Opinion: South Korea Eats Dog Meat, but Is the West Really Any Better? Dogs are shown locked in a cage at a dog meat farm in Wonju, South Korea on Monday, Nov. 21, 2016. Photo credit: Woohae Cho/AP Images for The Humane Society of the United States. 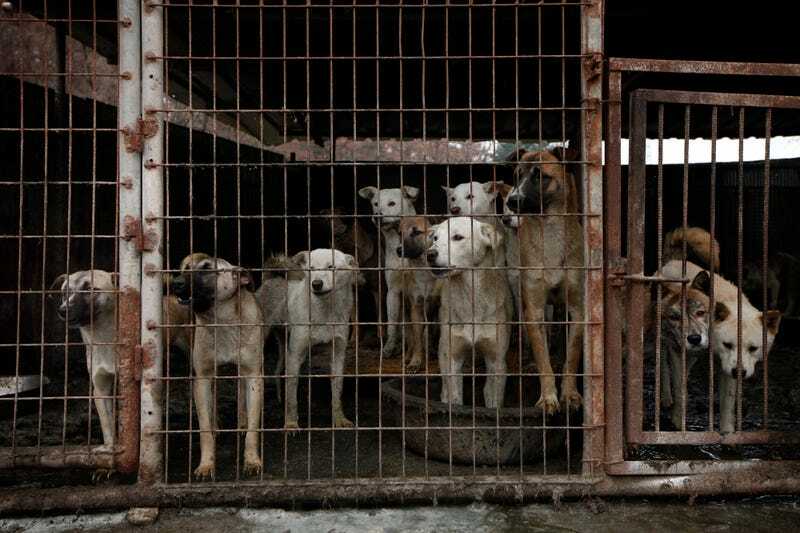 As the international spotlight turns to the Korean peninsula for the Winter Olympics, the South Korean government has tried to cover up one of its more controversial dining habits: restaurants near Olympic venues have been asked to stop selling dog meat. The government reportedly offered $2,000 for restaurants to drop dog meat from the menu, and $1,000 for taking out the word “boshintang” (a soup made from dog meat) from their signs, according to the Animal Welfare Awareness, Research and Education, a South Korean animal rights group. Most restaurants have refused, citing continued demand for dog meat as the primary reason to keep the controversial dish on the menu. The response from the international community has been palpable. USA Today produced a video on Korea’s dog farming industry, explaining that “a short drive from the burning Olympic torch and the excited throng of Winter Games spectators, there was no cheering outside the place where hundreds of dogs are packed in cages until they are killed for their meat.” CNN released a similar piece, highlighting the country’s “brutal trade in dog meat.”A petition to boycott the games because of the dog meat trade has received over half a million signatures. The disgust has even reached the Olympic village, with athletes pledging to rescue a few lucky dogs and bring them back to their home countries. At Project Earth, we couldn’t agree more with these sentiments. The thought of eating labradors in a stew or Chihuahuas on the Barbecue is horrible. But is it really that much worse than what the West does to billions of chickens, cows and pigs every single year? Let’s take a look at some numbers (all U.S. figures come from the USDA). According to the Animal Welfare Institute, South Koreans slaughters an estimated two million dogs every year. In the U.S. some 30 million cows are slaughtered every year. In all, Koreans consume about 220 million pounds metric tons of dog meat annually. The U.S. consumes about 85 billion pounds of chicken, beef and pork annually. The average American eats more than 210 pounds of meat every year—almost triple the global average. Across the entire world, an estimated 30 million dogs are killed for food each year. During this past December, 714 million chickens were killed in the U.S. All told, 8.9 billion chickens were killed in the U.S. during 2016. The conditions under which these animals are bred and slaughtered are nothing short of nightmarish. Undercover videos have shown how cows at a dairy farm were beaten and kicked and how workers at chicken farms kill sick or injured birds by running them over with forklifts or impaling them with nail-filled pipes. You might be saying sure, yes, that’s horrible, but dogs are way smarter than cows and chickens. That might be true. But pigs are pretty darn smart also. Research from the University of Pennsylvania has shown that pigs can recognize and distinguish individual pigs and humans, and can recognize themselves in mirror. They’ve even been taught to play video games. Their intelligence is certainly on par with, if not higher than, the average dog. And yet every year about 120 million pigs are slaughtered in the U.S. That’s 60 times more pigs killed in the U.S. than dogs killed in South Korea. And of course, it’s not just factory farms in the U.S. that have brutal practices when it comes to animals. Spain still sanctions the barbaric practice of bull fighting, where crowds cheer a team of armed men as they face a single bull. The UK has some 800 mega farms (defined as housing 125,000 chickens, 2,500 pigs, 700 dairy or 1,000 beef cattle) where thousands of animals are confined to cramped and squalid conditions. An undercover investigation into Mexico’s meat farms captured footage of animals being killed by clubbing, kicking, punching, and electric shock. We’re not saying that people in glass houses shouldn’t throw stones. Throw the stones! But not just at South Korea. We’ll leave the last word to Jason Baker, PETA’s Vice President of International Campaigns. The thought of killing, cooking, dismembering and eating dogs is horrifying, but there’s no rational reason why that same revulsion shouldn’t exist at the thought of eating a pig. All animals about to be slaughtered feel terrified, and none wants to die. Right here at home, sensitive, scared lambs, chickens, cows and pigs are killed as we willfully turn a blind eye to the fact that they are no different from the dogs we cry for.